I like the following blog post from www.SpeedProDigital.com/about/blog. The 5 reasons to get a vehicle wrap applies to Rotary as much as any no- for-profit or commercial enterprise. Using a vehicle as a mobile bill board is an efficient, effective and economical way to tell the Rotary story. 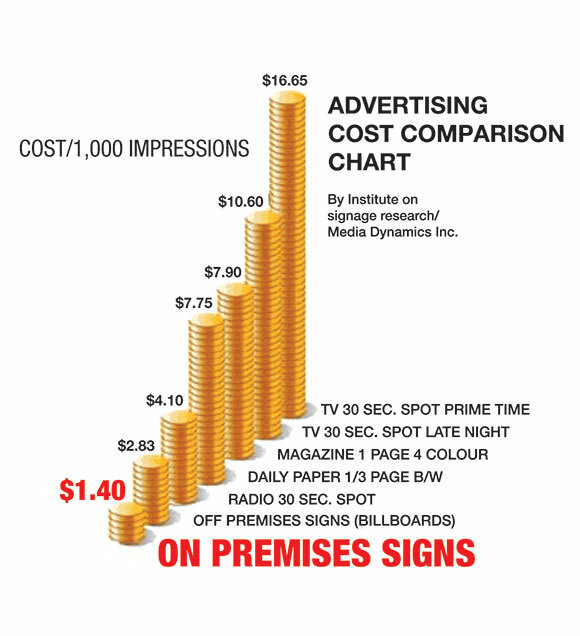 As the graphic above illustrates, a vehicle wrap is a moving billboard that costs around $0.10 per 1000 impressions, much less than all other traditional forms of offline advertising. The popular marketing author and public speaker Seth Godin promotes the need for businesses be like a “Purple Cow,” or in other words, businesses need to be remarkable to stand out among their competition. Vehicle wraps provide a unique way to be remarkable. Depending on how a wrap is designed, it has the capability to turn heads and get noticed. It takes 9 times for people to see your brand for them to remember it, and having the mobile billboard driving around their city or parked in their neighborhood increases those chances substantially. Vehicle wraps are viewed by over 72,000 people per month. When properly cared for, there are no on-going costs to maintain a vehicle wrap. Wraps do not need to be renewed and they do not expire like other forms of advertising. Contrary to popular belief, vehicle wrapping actually protects and preserves your paint job, given it’s installed by a seasoned professional. It can also be cleanly removed when it needs to be removed. ← Now Accepting Applications for the Rotary Peace Centers! Vinyl wraps are very affordable because, if taken care of properly, they are a one-time investment. You don’t have to incur recurrent costs unless you decide to change your advertising sooner, and it can attract new clients for as many years as you want to keep your vehicle wrap on your vehicle. Thank you for this very nice read. I definitely agree and would get a vehicle wrap some time in this month. Thanks for the information! I’ve thought about using vehicle wraps to advertise my company. These seem like good reasons to invest in a vehicle wrap. I agree with your point about it being a unique advertising medium. Most people don’t expect to see ads on cars, so it’s definitely a good way to get people’s attention. I blog quite often and I really thank you for your content.Your article has truly peaked my interest. I am going to bookkmark your blog and keep checking for new information about once a week. Want to place a bet that the Offers do this…or would this just be a sucker bet! I wonder why I didn’t get this post?